On July 17th 1938, Douglas Corrigan took off in an easterly direction from Floyd Bennett field and kept on going. Just over 28 hours later he landed at Baldonnel field near Dublin, and until the end of his life he maintained he’d been trying to get back to Long Beach, California. His aircraft was a nine-year old Curtiss OX-5 Robin, partially re-engined with the best parts from two J-6-5 Wright Whirlwinds, (making it a J-1 Robin, technically) and otherwise modified for long-distance flight. 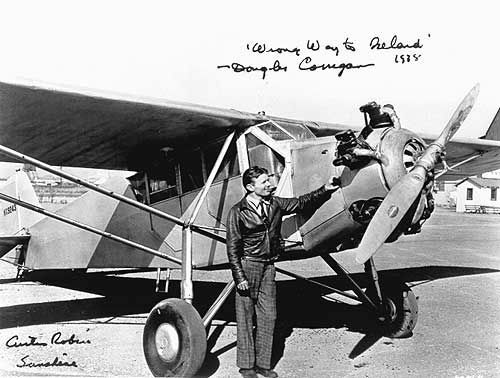 Corrigan was a aircraft mechanic and a devotee of Charles Lindbergh. Corrigan assisted in the construction of the Spirit of St. Louis and it was Corrigan who pulled the chocks away from the Ryan NYP at the start of Lindbergh’s solo flight in 1927. It’s a sad irony that Lindbergh never did acknowledge Corrigan’s Atlantic crossing eleven years later. Other notable Americans from Howard Hughes to Henry Ford congratulated him. Corrigan retired from aviation in 1950, but apparently on the 50th anniversary of his flight in 1988 allowed a group of enthusiasts to retrieve the Robin from its hangar and start it up. There is humorous comment on the Wikipedia page that Corrigan himself, by then aged 81, may have wanted to take the aircraft up for a spin. Knickerbocker, H.R. (1941) quoted in Wikipedia. Rumours persist that, later in life, Corrigan dispersed the parts of the Robin to prevent it from being stolen. I haven’t managed to track down any references to dispersed Robin parts in the Santa Ana area of California although I have no doubt a few such articles exist. There are a few nice pictures of Corrigan and the Robin at Baldonnel in the collections of the National Library of Ireland, and Bryan Swopes on This Day in Aviation has a picture of Corrigan and the Robin in 1988 at the 50th Anniversary celebrations. The the card model site Fiddlers Green has a different signed photo of Corrigan and the Robin taken at around that time. If you’d like to see the man himself explain things, try this public domain clip from YouTube. I wonder if some parts of the Robin will emerge in 2018 when we celebrate the 80th anniversary of the flight?